ZenCash and Blue-Frontiers recently signed a letter of intent to partner and explore technical opportunities where both projects can collaborate on a variety of timely social, economic, and governance issues. Blue-Frontiers is the commercial offshoot of the Seasteading Institute and has a mission to build offshore startup societies. ZenCash is leading the way on some key blockchain technologies, such as high privacy cryptocurrency, a peer-to-peer economic platform, and, importantly, a modern blockchain-based voting system leveraging zero-knowledge cryptography and game theory that could potentially have applications in how seasteads organize. ZenCash and Blue-Frontiers are philosophically aligned in using technology and the startup mindset to solve real-world issues, including social, economic, environmental, and even long-standing issues in politics with imperfect voting mechanisms. Blue Frontiers is thrilled to formalize a partnership with ZenCash. We recognize ZenCash as a leader in the cryptocurrency space – a leader that is true to core values of privacy and decentralization. We’ve been honored to have ZenCash founder Rob Viglione present at our First Tahitian Seasteading Gathering in May of 2017, return to Tahiti to lead a blockchain workshop in October, and to have him share the vision of seasteading during his presentations around the world. Rob has been instrumental in giving significant guidance to the Blue Frontiers token development. He is an asset to the cryptocurrency space and a true seasteader. Blue-Frontiers is doing an ICO to raise capital for their next phases of design and engineering to enable construction to begin on the world’s first seasteads in 2019. 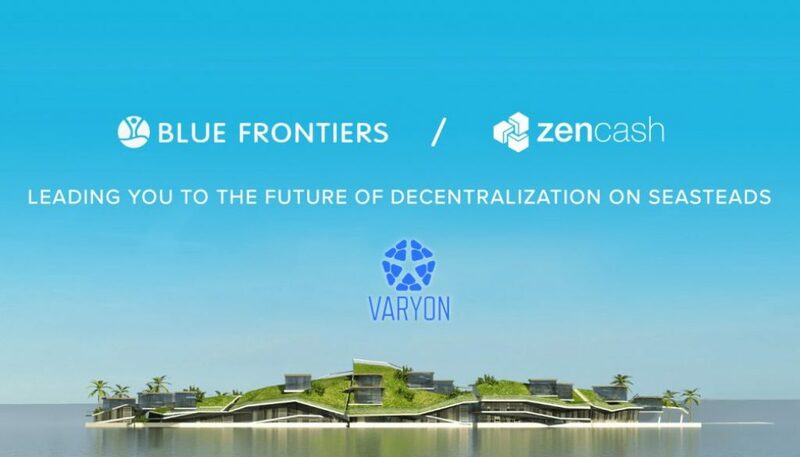 For people who interested in participating in the ICO, they have the ability to buy Varyon (VAR), Blue-Frontiers’ token, using ZEN and receive bonuses from 5-15% during the presale. Learn more here about purchasing your stake in the world’s first seasteads! Varyon (VAR) is a general purpose payment token for the exchange of goods and services in the Blue Frontiers ecosystem, other ecosystems, and between token holders. Blue Frontiers is planning to use the proceeds of the sale to expand its ecosystem and create SeaZones and seasteads, and will only accept Varyon (VAR) for its products and services. Learn more here. ZenCash Disclaimer: ZenCash is not a participant in the Token Launch or endorsing this Token Launch, and this article should not be considered as financial investment advice.